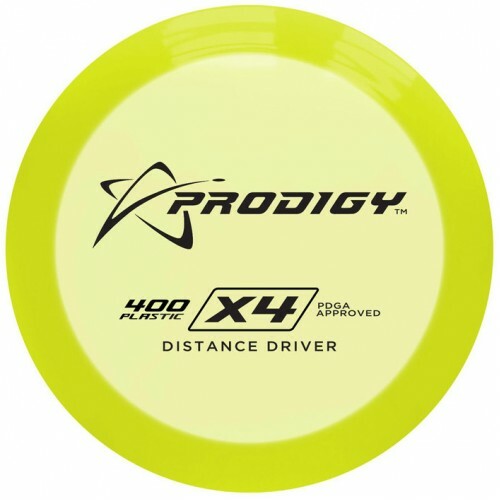 The Prodigy 400 X4 is a low-profile slightly understable high-speed distance driver. It is great for players with lower arm speed who are looking to gain more distance. The X4 is designed to hold a turnover even at a lower speed. It performs very well at low heights and in tunnel shots. For players with faster arm speed, the this disc golf driver will flip later in the flight path, and is perfect for long wooded shots or accurate turnovers. X Series, built for speed, are low profile, high speed distance drivers with less rim depth than the D Series. They are faster out of the hand and offer similar glide to the D Series. X Series are perfect disc golf discs for long wooded shots or accurate turnovers.